Get your giant felt tips at the ready, as children’s summer activity books are infused with weighty themes at this subversive exhibition. The peculiarly French theme of this exhibit is the ‘cahier de vacances’ (a summer-themed activity book for children containing vaguely fun yet thought-provoking exercises), an object familiar to many grown-ups from idle childhood holidays spent out in the country. Here, artist Steve Michiels offers a typically absurd and subversive spin on the concept in both a book and a blown up version at this gallery exhibit. 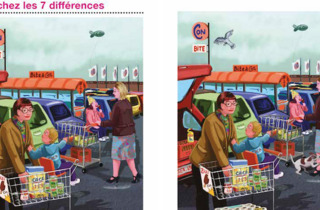 The Belgian cartoonist represents himself as a little middle class schoolboy, nervous and narrow-minded, who skewers all the classic ‘cahier’ activities: mazes, spot the difference, connect the dots, colouring in and, to keep the parents happy, some obligatory ‘educational’ pages. 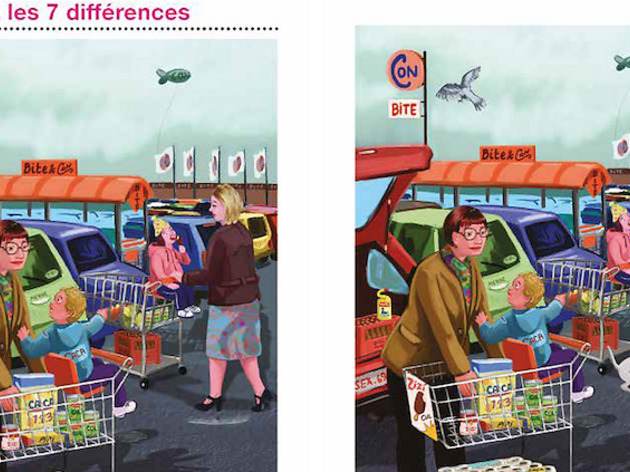 Michiels turns the whole thing on its head by infusing his puzzles with weighty socio-economic themes. The aim of the maze, for instance, is to get a disaffected young kid’s parents back together following a divorce. In the spot the difference, the magnificent tableaus show a swing party in a local village club. Elsewhere, he deals with terrorism, environmentalism, sexual relations, hypocrisy and society’s obsession with appearances. You can find original drawings and prints from Michiels’ baffling activity book at the Point Éphémère all summer.